Half way! 120 recipes down out of 240. It's taken me nearly 6 months though - 6 months to do the whole book is looking a bit amibitious. I have no idea how julie powell cooked 550 recipes in a year. She would have done 250 recipes by now, and i feel like i've been really going for it. it must have completely taken over her life. 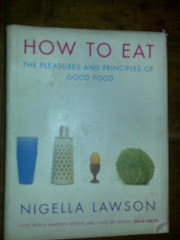 Anyway, i'm really enjoying it and learning lots, so here's to the next 120 recipes. Had this with the chickpea couscous and it was a bit chickpea-tastic. i think i'd add fewer chickpeas next time, and more vegetables. The chicken thighs were delicious in it though - much tastier than chicken breast and less bony than wings - from now on, its "Eat More Thighs". 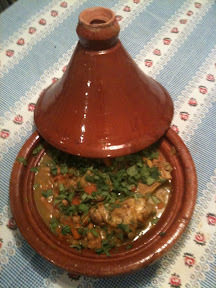 I didn't cook it in the tagine above, because you can't use it on the hob, but it looks more authentic for the photo! - Put 1 onion, 5 cloves garlic and 1 stick celery in a processor and finely chop. - Heat 3 tablespoons olive oil in a casserole on the hob and brown 10 chicken thighs. - Remove to a plate, add the onion mixture and cook for 5 mins until soft. - Add 2 carrots cut into batons and cook for a further 5 mins. - Mix 1 tablespoon flour with 1/2 teaspoon cinnamon, and 1 teaspoon each of cumin and turmeric, add to the pan and cook for a couple of mins. - Put the chicken thighs back in, add 2 tins chickpeas, pour over 400ml white wine and 300ml chicken stock. - Season and put on a low heat for about 1 hour. - Sprinkle with coriander to serve.